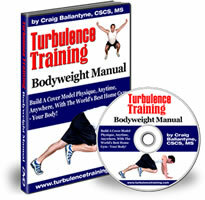 Making time for exercise is the take away tip in Turbulence Training Day 16. Home fitness workouts that'll burn fat and sculpt your body in 4 weeks. Welcome to day 16 of Turbulence Training's Buff Dudes and Hot Chicks fat burning workout. "Hello and welcome to day 16 of the Buff Dudes and Hot Chicks workout, I'm Asad from Better4Fitness.com. And no the glasses are not new, before you ask, I just haven't worn them before. Today was a rest day and unfortunately I was very busy during the day, and I didn't have my camera with me, I had to get my walk done in the middle of the day, so I wasn't able to record it. But I'm checking in now, just to let you know that I went for a 60 minute walk. It wasn't in a park this time, so you're not missing out. It was just around some blocks within the city. But that just goes to show that if you're willing to make time within your day, no matter how busy you are, you will get things done. That includes exercise. That's what I did today, made some time within the middle of the day and got my walk done. Even though it's a recovery day, it's important and I didn't miss it out. I so could have easily said 'I don't have time for this today, I'll miss it out, it won't matter' but every single day matters. If you're willing to make time within every single day, then you'll have time within every day. That's the take away point from today, I didn't mean to preach but it's just the way that I feel. If you can get into that kind of mindset, then you will do some sort of activity everyday. And that is the main key to burning fat - that you're doing something everyday (MAKE time for exercise). So that's it for today, enjoy your day or night wherever you are, and I'll see you tomorrow, take care."